CHARLOTTE, N.C. – Mutual of Omaha celebrated another stellar year of business partnering with National Agents Alliance in 2013 and rewarded the top 10 managers of the Alliance with Mutual of Omaha with a gift to commemorate the partnership’s five-year anniversary. The partnership between the two companies started on June 1, 2009 and has grown every year with NAA. National Agents Alliance submits hundreds of applications weekly making them the No. 1 life insurance producer with Mutual of Omaha for the past four years. 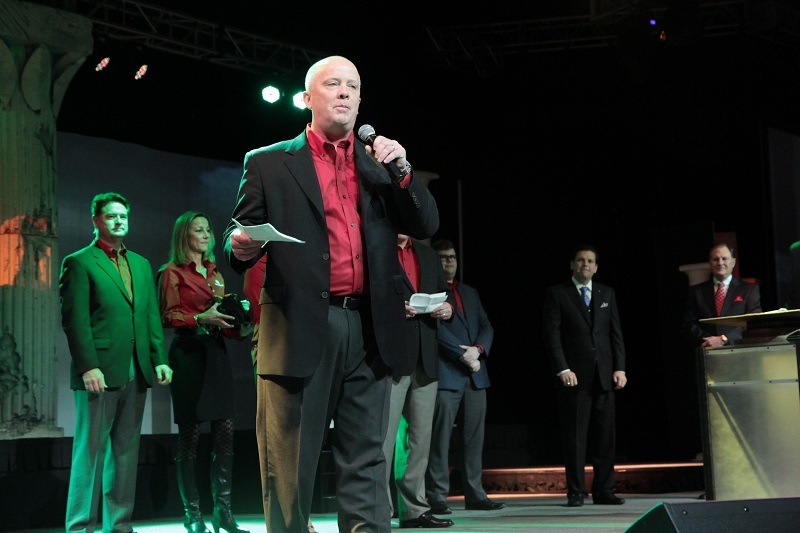 Mutual of Omaha’s Senior Vice President of Sales, John Haver, presented the gifts, along with Vice President of Brokerage Sales, Tess Grace and other Mutual of Omaha team members on stage during NAA’s “Fight To Unite” National Convention in Charlotte, N.C. on Jan. 11. NAA President and CEO Andy Albright and Chief Operations Consultant Jim Henson watched proudly as Haver and Grace along with their team presented the handmade Hager SERE (Survival, Evasion, Resistance, Escape) men’s watch and a Tiffany’s bracelet to the women. The anniversary gifts were awarded to: Andy and Jane Albright, Alex and Heather Fitzgerald, Paul and Tamara Roberts, Jason and Tawny Carey, Stephen and Hollie Davies, John Wilson, Bill and Diane Lampe, Patrick and Suzanne Connors, Adam and Beth Katz, Chris and Cortney Long and Kyle Winebrenner. Albright said the gifts from Mutual of Omaha were a first-class gesture by Haver and his staff. Haver said the relationship with The Alliance continues to get stronger each year and predicted another banner year in 2014. Mutual of Omaha also provided a photo booth for NAA agents to pose for pictures during the weekend. Agents were able to dress up in some fun hats, glasses and boas to add a little fun to the event. The pictures were provided free of charge and a printout was given at the booth. Mutual of Omaha is a full-service, multi-line provider of insurance and financial services products for individuals, businesses and groups throughout the United States. Founded in 1909, Mutual of Omaha and its affiliate companies are ranked among the Fortune 500.